Over the July 4th weekend I joined Roo­sevelt Muriel from Colombia, as well as other pastors and leaders from various nations as they gathered in Philadelphia to pray for America. They wanted to meet in Philadelphia because it was home to the first Su­preme Court, the first federal capi­tal before Washington, D.C., and the birthplace of the Declaration of In­dependence. It is in many ways the hedge waters of the nation, the place of beginnings. 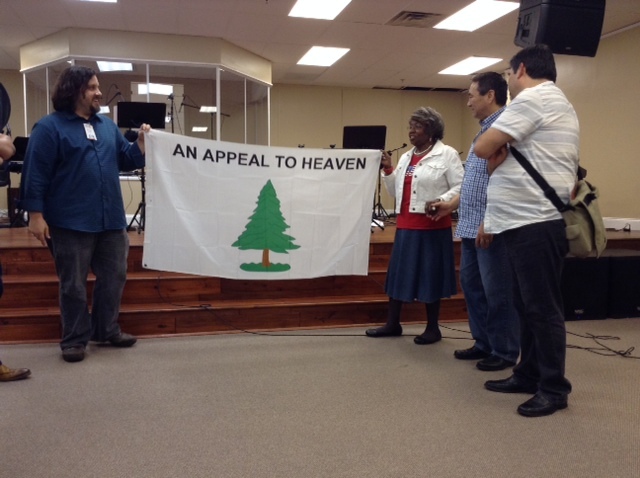 At the end of that day, dear friends and leaders from the area gave me a flag with the words, “An Appeal to Heaven.” It is a replica of the similar flags George Washington used before the United States had its own gov­ernment. There was no official Navy, but Washington flew this flag on six of his ships, and it was to appeal to heaven. The flag includes a picture of an ev­ergreen tree which was a symbol Na­tive Americans used at the time to indicate a covenant. When tribes made a treaty, they would bury their weapons underneath an evergreen tree as a symbol of a covenant prom­ise and treaty. To many the ever­green tree also depicts an everlast­ing covenant, even as Jesus hung on a tree (The Cross) as an everlasting covenant to us. Above the symbol of the Evergreen Tree was written, “An Appeal To Heaven”. Sometimes, when people didn’t have the oil, they would put a costmary leaf inside their Bibles. When feel­ing tired and weary during a church service or time of prayer, they would pull it out and smell the leaf or nib­ble on it to wake themselves up. They commissioned me to be bearer of that message across the nation and around the world, now is the time to bring An Appeal to Heaven for the cities and nations in which we live. That flag has been with me at numerous prayer gatherings and significant meetings since then. We took it with us as we prayed along the US and Mexico border this summer, and to other key places. At the end of September, Lisa, Ashley and I went to the airport. I dropped them off for their trip to the Hope Mission Home orphanage in India and I flew on to Baton Rouge, LA. I had been invited by David and Cindy Lane to meet at a dinner with 25 leaders and Governor Bobby Jindal and his wife Supriya. It was great to meet with these national leaders. After dinner I had an opportunity to meet with the governor. I was very moved by how genuine, humble and down to earth the governor and his wife were. 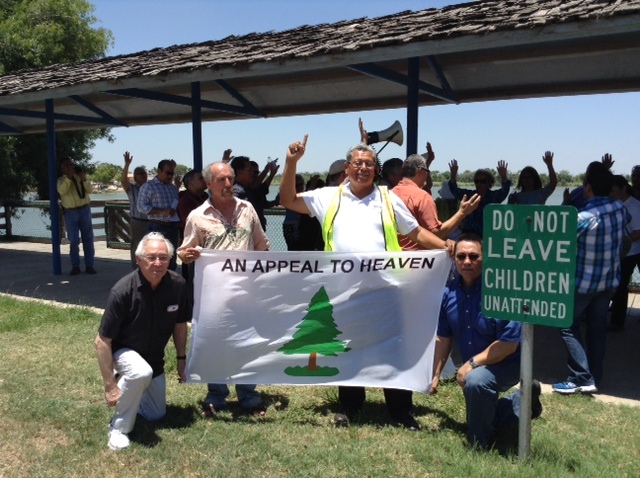 As we prayed, I felt a sense of God’s presence and I felt led to give him my “An Appeal to Heaven” flag. Even though I have passed on the flag given to me, I have gotten additional flags to give to other key leaders as the Lord directs. An Appeal to Heaven is America’s only hope. Will you join us as we cry out again for God’s mercy?